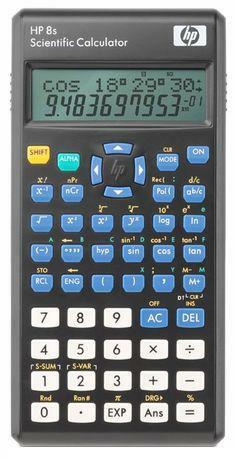 The HP 8s Scientific Calculator is a perfect calculator for Students solving everyday problems in the classroom. HP 8s is also a calculator for everyday living like adding shopping list expenditures, comparing volumes with prices, tracking day-to-day expenditures. HP 8s is perfect for office calculations and calculating quantities for home improvements. The HP 8s comes with 240 functions with Algebraic Method for data entry with individual plastic keys, a dot matrix, 2-line display with 10 + 2 digits. HP 8s has a multi-replay function, fraction calculations, Combination and Permutation, Statistics. 9 variable memories, comes with slide-on hard case. HP 8s has a LCD view area of 61 x 18.8 pixels with 2 display lines. 10 calculation digits and a maximum length of command line of 79 can be displayed on the HP 8s. HP 8s can replay function: up, down, left, right. It has error indication and an easy to set Decimal point selection. Scientific Functions on the HP 8s are trigonometric, inverse, logs, powers and roots of equations, permutations, combinations and factorials. With Scientific display of 10+2. HP 8s has statistical features that can find mean, standard deviation, variance and regression analysis with STAT-data editor. The HP 8s needs a power supply of 2 x CR2032 Battery with a life of between 3 to 5 years. Batteries included. HP 8s has a well designed placement of keys. HP 8s physical size (L x W x D) is 15.7 x 7.5 x 1.2cm. HP 8s weight is 120g.